It’s been a couple of weeks since I posted about my blood spot mangave‘s surprise flower stalk (see post here). But it was only getting started! On October 7th the mangave stalk was just 10-inches tall … today it’s over 36-inches and I’m sure it’s not quite finished yet. Rising ramrod straight from the central rosette, it shares many of the same characteristics of the agave multifilifera that bloomed recently at the rear of the property (see that post here). 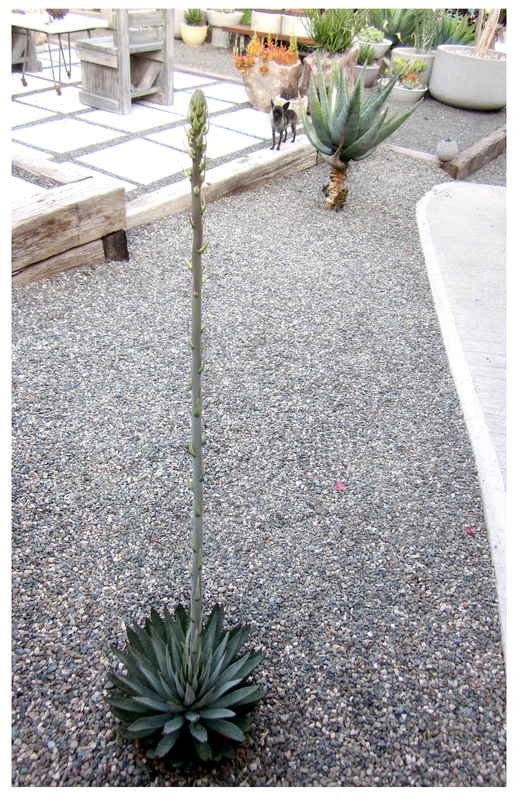 I just wonder if this mangave stalk will reach that agave’s final length of 50-inches … or maybe even pass it? Inky’s hanging back as I take the photos … I wonder if she remembers how she and her brother, Frito, used to chew this plant’s leaves when they first arrived here; their little semi-circular bite marks somehow avoiding its sharply-spiked tips. The mangave survived being a chihuahua chewtoy and the poochies have moved on to more swift-moving game: the Rancho’s numerous lizards. Both plant, and dogs, have obviously matured … A coming post will show this amazing plant’s flowers once they appear, and I’ll give a final stalk length. I’m thinking — hoping — the final tally will top a full 60-inches! Was by your place yesterday and couldn’t believe it when I spotted it. Didn’t know how tall it should be but can’t wait to see the end result, blooms and all…. Makes two of us, Vickie! Haha … somehow I knew that! I think so too, I’ve never seen a mangave bloom before! Love the Inky for scale. You’ll have to report back on whether this plant survives it’s bloom. I’m thinking it looks so much like an agave that survival is unlikely, but this plant is a hybrid, so it’s all possible! Inky did seem really interested in the photo session; I’ll keep you posted on the mangave’s progress, Jenn!